The truck is made entirely of heavy 14-gauge steel with North Star's blue powder coat finish. Each truck comes with four pair of shelf brackets, which will yield five shelf levels (the base carries the fifth shelf). North Star shelves are simply 24" x 36" rectangles of 1/2" finished plywood. Those who need heavier shelves, some other configuration (such as two 12" x 36" shelves per level) or who want to save on shipping cost find it easy to make their own. Constructed from 1" heavy wall pipe and welded shelf supports, it is 72 3/4" high, 35" wide and 24" deep. The four 4" diameter rubber swivel casters roll easily when cart is loaded and can be firmly locked in place when needed. Includes plastic cover. An optional set of 12" x 32", 1/2" thick exterior plywood shelves is also available. 1-year warranty. Welded support rails offer added strength and stability and side frames include holes to adjust the top two rails for holding larger diameter bats. This strong powder coated steel cart glides on 4" diameter rubber swivel casters and is a great place to store your unused bats. Once in place the casters can be locked to prevent rolling. It holds up to (90) 14" bats, with adjustable shelves for almost any size bat and a top shelf that can be used on a ware cart. And to keep them securely in place, the Batmobile includes the brent® BatBrace (see photo). Acting like a "bookend", the BatBrace keeps up to 50 12" or 14" bats from sliding. Assembled dimensions: 47 3/4" wide, 36" high, 14 1/2" deep. 1-year warranty. Welded bottom support rails offer added strength and stability. This mobile, efficient means of loading and unloading your kiln is 47 3/4" high, 36" long and 14 1/2" wide. 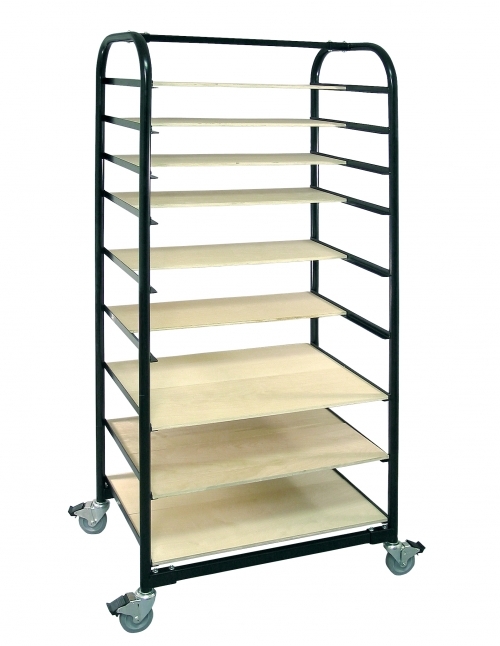 Steel rods keep up to 16 shelves (up to 20") stored vertically and separated for less damage. Three shelves give you room for stacking posts, cones, stilts, pots, etc. and are interchangeable with our ware cart shelves. 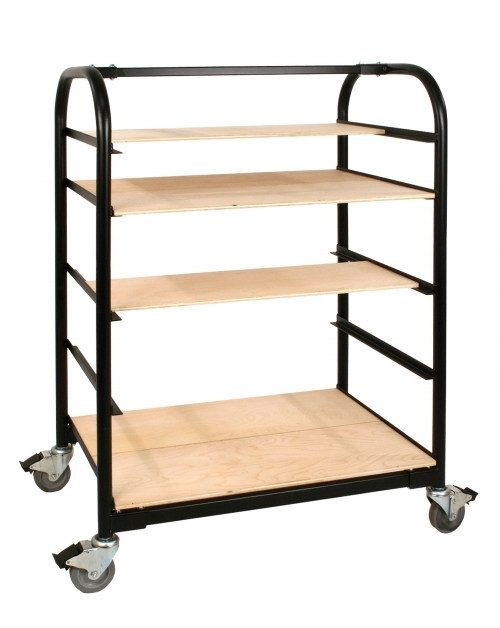 This strong steel cart rolls easily on 4" diameter rubber swivel casters. Once in place the casters can be locked to prevent rolling. 1-year warranty.